This just grinds my crackers. Discovery Communications has just announced that they'll be producing a "reality TV" series starring Sarah Palin on Alaska's wildlife, to showcase the "powerful beauty of Alaska". For this, she'll be paid $8 million. Have they lost their minds? Do they not remember that this is the same Sarah Palin who escalated Alaska's war on wolves and offered a $150 bounty for the severed front-forelegs of dead wolves? The Sarah Palin who fought against increased protections for America's struggling polar bear populations? And the same Palin who fought against the increased protections for the dwindling Cook Inlet beluga whales? 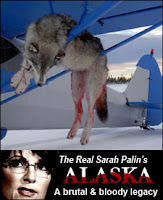 I'm angered that Discovery Communications, known for their wildlife-focused productions, would choose to embrace such a controversial and anti-wildlife person as Sarah Palin to represent Alaska and the wildlife that lives there. That's why I've joined Defenders of Wildlife's fight to get Discovery Communications to drop kick Sarah Palin's new show, and I am hoping you will too. Please sign the petition online at http://action.defenders.org/discovery. My friend's father used to work with Palin when he was a senior scientist at the Alaska Department of Fish and Game and he complained vociferously how Sarah routinely ignored the recommendations of his organization, endangering far more species than the ones mentioned above. Ugh. I am signing this now! I am disappointed in the Discovery Channel. There are so many wonderful people out there that are passionate about wildlife. Why are they going to hire this person who is in it for the money? Ugh. I signed. That said, I think you're off base with the voters thing - I'm not so sure she wants public office, she wants stardom. Between the Fox "show" and this, it's just another thing for the brand. Thank you for posting this. I signed. I had no idea that the Discovery Channel was planning that. Disappointing. I signed it although I truly want to believe that it is all some sort of nasty April Fools. The other news is that Sarah's Non-Son-In-Law-From-Hell is rumored to be going to pitch ANOTHER Alaska based "reality" show, around himself! I was proud to sign! What an outrage! Thanks for spreading the word! Oh please someone, SOMEONE tell me that this is an April Fool's joke too?!? Please? Pretty please? I was thinking this has to be on of your famous April Fool's pranks. Ummm aren't most of the polar bears living in Canada? Signed, gladly. Props for an extremely elaborate fools day joke, if that's what it is. I believe it that she's a fame hound. Seems like Discovery is selling out for ratings too. All the people that love her watch and swoon, all the people who hate her watch and play drinking games. This is an April Fools right? Even American televison can't be that stupid. Done! And emails sent to more people! This is just crap. Ugh. And guess which Australian-born, extremely right-wing media magnate owns the Discovery Channel? Can't guess - I'll give you a hint. His initials are RM and he also owns Fox (more accuately Faux) News. signed. did you notice over 150,000 people have signed as of April 2? I signed and posted a link to my facebook account. Gotta get the word out. This is just nuts! Whose brain child was this?!?!?! THEY SHOULD BE FIRED! Not only have we signed the petition, but have also gone directly to Disc. Comm. and left complaint. Next step ... communication to their sponsors!! pull money from the commercial providers! This makes me sooo angry. Thanks for the heads up on this one. I am really disappointed in this. I have signed and sent this on to friends. I have one word to describe this situation-REVOLTING ! Thanks again for the info and link.